1. What is an OPE file? Observations of Subaru Telescope are conducted by executing script files called 'OPE file (Observation Procedure Execute file; but often called OPEration file)'. Observers are requested to prepare the OPE file describing the sequence of your observing tasks prior to your run. An OPE file consists of information on your targets and individual operating commands such as target acquisition, exposing, focusing, filter change, etc. Please prepare for your OPE files and send them to the Support Astronomer (SA) by e-mail. On the observing night, SA and telescope operator will load your OPE file onto the observation control system and perform the observation by following your requests. Each individual command will be executed by SA and telescope operator on a line-by-line basis. Since operators can choose any command line to execute in your OPE file and you may also edit and modify the OPE file at the summit, command lines do not have to be sorted exactly in the order of your observation plan. However, if you write down command lines in a sorted order with reasonable comment, it would be helpful for SA to understand your intent correctly and to prevent misoperation. You may include all the targets in one OPE file. However, it would be a good idea to separate your OPE file into reasonably small files especially by each night in the case you awarded two or more nights and have a lot of targets with multiple filters/modes to observe. The template OPE file can be downloaded from here. Please follow this template file and the description below to prepare your OPE file. An OPE file is composed of three parts. All parts should be included in the OPE file. The information listed here does not have to be the exact amount. Several preset parameters (e.g., $DEF_TOOLS) are defined here. Please do not modify or remove them. Your target list and parameters which can be referred to in the COMMAND part (see below) are defined here. You can also define object names (written into fits header), coordinates, position angle of your target fields. Commands for operating the instrument and the telescope are listed here. One line contains one command. : Definition of the object name. "***" will be the alias name used in the OPE file. "###" will be written in the fits header. This command is used to define the object to observe. Accepted format for "RA" and "DEC" are "hhddss.sss" and "±ddmmss.ss", respectively. Do not use "hh:mm:ss", "hh mm ss", etc. Alphabets, numeric characters, and "_" (underscore) are only accepted in the "***" part of "OBJECT" parameter. Do not use "+", "-", etc. Example NEO1=OBJECT="NEO 1" FILE="08 20001231neo1.eph"
This command is used to define the object to observe with non-sidereal tracking. An additional eph file which describes pointing coordinates is needed. See information here before creating eph files. It is recommended to use JPL HORIZONS System (http://ssd.jpl.nasa.gov/horizons.cgi) to prepare eph files for solar system objects. Do not erase "08" in the "FILE" parameter. These commands are used to take bias or dark frames. Since HSC has small gaps in the shutter, you should take these calibration data when the outside is dark enough in the case you need accurate bias and dark frames for reduction. It is accepted to take these frames from 30 min after sunset to 30 min before sunrise. Usually, five dark frames with 300s exposure and 10 bias frames are taken every HSC observation run. Because all calibration data will be shared through the observers in the same run, you may not have to obtain your own bias and dark frames. Detailed information of parameters with "*" are described in the description below. : Focus position. Please use "3.75". : Rotator angle. Please use "0". ShutdownDomeFlat has no parameter to set. Other parameters included in the example are just used for confirmation. It is recommended to use these parameters, but note that they will not change the status of the telescope or HSC. These commands are used to take dome flat frames. "SetupDomeFlat" configures the instrument and the telescope for the domeflat, including dome lamp settings, position angle, etc. GetDomeFlat command takes the dome flat. "ShutdownDomeFlat" turns off the lamps. To make sure the count in the flat frame is appropriate, "GetDomeFlat" command is usually divided into two parts; the counts of the first flat frame will be checked before taking the rest of the flat frames. "SETUP=SETUP" parameter will power cycle the dome lamps and change the voltage and electric current to the requested value. Meanwhile, "SETUP=CHANGE" parameter will just change the voltage and electric current (it will not turn on the lamp). Typical combinations of appropriate dome lamp settings and exposure times are as follows. These configurations are set to obtain flat frames with the peak count of 18000 ADU. Filter "VOLT" "AMP" "EXPTIME" "LAMP"
Obtaining dome flats are accepted from 30 min after sunset to 30 min before sunrise. To ensure the stability of the flat lamp brightness, flat frames are able to be obtained 10 min after turning on the lamps. Due to the time limitation, only one sort of flat frame can be taken before or after observation (e.g., take HSC-r2 flat in the evening, and then take HSC-i2 flat in the morning). Because all the calibration data (including flats) will be shared through the observers in the same run, you may not have to obtain flat frames if they were taken in the previous observations. Conversely, if you are the one who is using a certain filter for the first time in the run, you generally have to take the flat frames during the evening twilight. If you wish to obtain twilight flats, contact SAs in advance of your observation. Note that you cannot take both of dome flat and twilight flat during one twilight period. Please use "OFFSET_RA"=40, "OFFSET_DEC"=90, and "INSROT_PA"=-90 to ease the operation, in the case you do not have any particular value. Other parameters included in the example are just used for confirmation. It is recommended to use these parameters, but note that they will not change the status of the telescope or HSC. These commands are used to take a standard star field. "SetupField" moves the telescope to point the specified coordinates with a specified position angle ("INSROT_PA"). 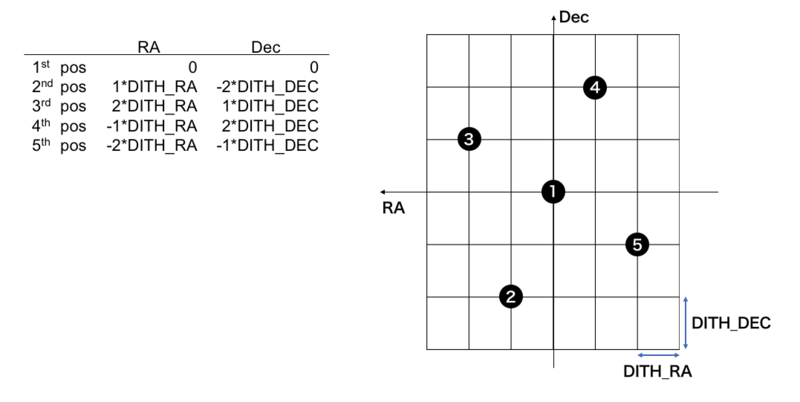 "OFFSET_RA" and "OFFSET_DEC" are the offsets to be added to the RA and Dec of the target field, respectively (See here for information of CCD arrangement and position angle). Since usual spectrophotometric standards are single objects, "OFFSET_RA", "OFFSET_DEC", and "INSROT_PA" are used to prevent the star placing in the gap of the CCD. "GetStandard" command changes the telescope focus by "DELTA_Z" (=defocusing) and then makes one exposure at the position where the telescope is pointing. After the exposure is done, the telescope focus will be set back to the original position. Note that "GetStandard" command never changes the telescope pointing and the position angle by "OFFSET_RA", "OFFSET_DEC" and "INSROT_PA" parameters. They are only for confirmation and the consistency with other commands. In the case you want to execute standard star observations with several settings (i.e., different offsets, different PAs, etc. ), you should use the "SetupField" command first. In general, popular standard stars (such as Landolt's stars or typical spectrophotometric stars) are generally too bright for on-focus imaging with HSC to obtain reasonable photon counts in the linearity range even with a shortest exposure time. Therefore, defocusing is usually needed for standard star observations. Typically, reasonable defocusing on the order of 0.2–0.4 mm is needed for exposing 12–13 mag stars for "EXPTIME"=5–10s using broad band filters. Any stars brighter than 11 mag would be unavailable. These commands are used to take single-shot exposure at a specified field. "SetupField" moves the telescope to point the specified coordinates with a specified position angle ("INSROT_PA") (See here for information of CCD arrangement and position angle). "OFFSET_RA" and "OFFSET_DEC" are the offsets to be added to the RA and Dec of the target field, respectively. "GetObject" command makes one exposure with "EXPTIME" at the position where the telescope is pointing. Exposure time should be 2–1200s. Use the HSC exposure time calculator to calculate the appropriate value. Note that "GetObject" command for the single-shot mode never changes the telescope pointing and the position angle by "OFFSET_RA", "OFFSET_DEC" and "INSROT_PA" parameters. They are only for confirmation and the consistency with other commands. In the case you want to execute single-shot observations with several settings (i.e., different offsets, different PAs, etc. ), you should use the "SetupField" command first. Four CCDs place in the outer edge of field of view (2_01, 2_02, 2_17, and 2_18) are for auto-guiding. This means that the images for auto-guiding are those taken with filters, as same as the science data. A star which is taken with the guiding CCDs will be automatically selected as a guide star based on the GOODMAG value with "SELECT_MODE=SEMIAUTO" mode. In "SELECT_MODE=MANUAL" mode, you can select a guide star interactively with the observing control system. In most case, "SELECT_MODE=SEMIAUTO" with an appropriate value of "GOODMAG" and "AG_EXP" will work. Appropriate combinations of "GOODMAG" and "AG_EXP" are as follows. Note that customizations of these values are needed to adjust the weather condition. Use this single-shot mode with open-tracking for non-sidereal objects. "DITH_RA", "DITH_DEC", "OFFSET_RA", and "OFFSET_DEC" parameters must be same between "SetupField" and "GetObject". Otherwise, the dithering motion would be made in an unexpected manner. These commands are used to take five exposures at a specified field with a predefined five-point dithering pattern. "SetupField" command moves the telescope to point the specified coordinates with a specified position angle ("INSROT_PA") (See here for information of CCD arrangement and position angle). "GetObject" command makes five exposures with exposure time = "EXPTIME" with telescope dithering described below. Exposure time should be 2–1200s. Use the HSC exposure time calculator to calculate the appropriate value. Predefined dither pattern of the five-shot mode is as follows (relative to the center (0,0), which is the point given by the object information and the offsets). "DITH_RA" and "DITH_DEC" should be 60 or more. If you need to start the exposures from the (i+1)-th position, add SKIP=i to BOTH of "SetupField" and "GetObject". If you need to stop the exposures by the j-th position, add STOP=j to BOTH of "SetupField" and "GetObject". You can combine the "SKIP" and "STOP" parameters. For example, "SKIP=1" and "STOP=4" will take the 2nd, 3rd, and 4th shots of the five-point dithering. "NDITH", "RDITH", "TDITH", "OFFSET_RA", and "OFFSET_DEC" parameters must be same between SetupField and GetObject. Otherwise, the dithering motion would be made in an unexpected manner. These commands are used to take N shots (N="NDITH") at a specified field with an N-point circular dithering pattern. "GetObject" command makes "NDITH" time exposures with "EXPTIME" with telescope dithering described below. Exposure time should be 2–1200s. Use the HSC exposure time calculator to calculate the appropriate value. The dithering pattern of this mode is defined as below. The center of the dithering circle is the point given by the object information and the offsets. The listed positions are the relative values to the center of the dithering circle. In the case if you set "NDITH=5", "TDITH=0" and "INSROT_PA=0", the offset of the RA direction between 2nd and 5th (and also between 3rd and 4th) exposure will be equal (this case is described with open circles in the figure above). This sort of dithering pattern will drop a certain star into the gap of CCDs for twice or more during the dithering observation, which may reduce the quality of the data. When you conduct N-shot dithering mode, we encourage you to determine the appropriate value of "NDITH", "RDITH", "TDITH", and "INSROT_PA". It is recommended to use "TDITH=10" for "NDITH"=5 or 8, "TDITH"=5 for "NDITH"=7, and "TDITH"=15 for other "NDITH" values. Please note that large "NDITH" increases the risk of deviation in the offset angle when the dithering is unexpectedly interrupted in the middle. If you need to start/stop the exposures at i-th position, use the "SKIP" and/or "STOP" parameter in BOTH of "SetupField" and "GetObject" (see description of section 4.2.2). This command performs multiple exposures for focusing. This command will first move the telescope to point the provided coordinates. Focusing will be conducted by taking seven frames by changing the Z-axis position of HSC and nodding the telescope toward DEC direction. CCD readout will be conducted after all seven exposures are finished. The optimum value of "Z" is 3.4–3.6. This value will be customized by SA during the observation. By setting "RA=!STATS.RA" and "DEC=!STATS.DEC" parameters, you can perform the focusing at the current telescope position. To conduct focusing with non-sidereal tracking objects, use "SetupField" command before running "FOCUSOBE", as described below. These commands conduct the filter exchange of HSC. "FilterChange1" first set the telescope, rotator angle, etc. to the proper position for filter exchange and then changes the filter. "FilterChange2" prepares the telescope and HSC to resume the observation. Aliases for HSC filters are below. When we proceed your HSC observation, we would like to ask you some requirements and recommendations listed below, which may take some observation time from you. When you take only long exposures (>=2min/shot), take a 30s exposure on at least one of the fields according to 2-i. and 2-ii. *As the Pan-STARRS1 catalog is available in HSC pipeline from 2017/2, calibration frame does not have to be obtained with the SDSS fields. If you take short exposures (<= 60s) continuously more than 20 shots, the on-site analysis system may be stopped by the SA to avoid the stall of the system. You may continue observation but information from the on-site analysis system will not be available. When you restart the long exposure (> 60s), on-site analysis system will be restarted. In small dither, use dither steps of r > ~120 arcsec for the IMAG_N mode, and r > ~60 arcsec for the IMAG5 mode. Continuous short exposures (< 3s) more than 20 shots should be strongly discouraged because it would cause a data transfer stall. You cannot divide long commands into several lines. The following expressions are not allowed or should be avoided in OPE file. Any quotations in comment lines - e.g., # exposure in i' band, "double quotations"
The commands used in the OPE file are not case-sensitive except the characters within the double quotations. In the azimuthal direction, dome rotation takes 3 min per 90 deg (0.5 deg/s). approx. 35s including wiping, readout, etc. 60s for changing the PA by 90 deg. Turning the instrument rotator can be done at the same time with CCD readout. Auto-guiding works from 30s after the exposure starts, and ends 10s before the exposure finishes. Therefore auto-guiding is effective for long exposures (> 60s). It is recommended to use auto-guiding for exposure longer than 240s. To check the field-of-view with Aladin, please see HSC FoV Check with Aladin.